Oxfordshire, Warwickshire & Surrounding Areas! Just a quick note to say thank you for doing so well with keeping our guests entertained last night. The casino table was a great hit. Sorry I didn’t get to see you at the end but your croupiers did an amazing job on Saturday. Wouldn’t hesitate to use you guys again so really easy to work with from start to finish. What a brilliant night!! Professional, friendly, engaging, no fuss, no stress!. Thank you Martin and your fantastic team for making a good night into a fantastic night. We had a very mixed guest list and having the gaming tables was a great way to get people together and chatting - they loved it. Thank You - Dawn. Just wanted to drop a line and say thank you so much for a great night on Saturday. You were both so nice and great fun. Everyone has been singing your praises ever since, and my son absolutely loved it. Everyone had a wonderful night, perfect! The whole process was easy and stress free. The croupier was fantastic, and all the guests loved it. Would highly recommend Sevens if you want a party everyone will remember! Thank you so much!! I wanted a casino experience for a surprise birthday party I was hosting at home in mid-Oct 17. 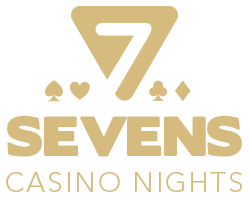 I took a look at Seven Casino Nights as it seemed to be a local business run by someone I could talk to, rather than a big nationwide enterprise that was just passing my details on to some different team. Since I had never done this before, and didn't really know anything about Casinos, I needed someone I could talk to who wouldn't take advantage of me. I feel I struck gold with 7 and Martin - he was super helpful, listened to my ideas, and walked me through all the different options. We eventually came up with a plan (Blackjack and Roulette) and from then on I really didn't have to do anything - the drop off, set up (the tables looked amazing), the arrival time of the croupier (who was fantastic), the pickup time - all was simple and clearly communicated and completely stress free. My guests had a great time, most of them were new to it and the croupier educated and engaged them. I think my son now wants to be a croupier. Martin was great, entertaining everyone with some tricks when he picked up the tables. It was a great success, good value for money, and I would definitely do it again and recommend it to others. Everyone loved the casino tables and the Las Vegas sign! I loved it so much!! It really kept our guests entertained all night!! Booking was so easy and we had the most fantastic night for my partners 60th Birthday, held the party at home and Jim was a great croupier, it certainly made our evening one to remember, and we will certainly use this company again. I have worked with Martin and his team twice now and each time he and his team have been fab, friendly and prompt. Used the tables at a cancer research fundraising event and he helped raise funds by suggesting some extra games. Communication was always easy and he was happy to explain everything to me beforehand. Thank you Martin, will definitely use again in the future. Absolutely superb from you and the staff. The tables were packed and everyone said it was such a great idea. We are recommending you to everybody! Absolutely brilliant entertainment,all we could have hoped for! Tell us what you think about us. Submit a testimonial! Follow us on social media to join the fun! "Absolutely superb from you and the staff. The tables were packed and everyone said it was such a great idea. We are recommending you to everybody!"